I completed my art training at Loughborough College of Art & Design where I gained a BA Hons in Fine Art:Painting. After teaching and managing an Art Department in UK schools for 24 years, I decided to relocate to Côtes d’Armor, Brittany where I now work full-time as an Artist and Teacher. For further news on my Art Workshops and the progress of my own Artwork click here to view my blog. Much of my work is based on everyday objects or the human figure in a simple interior setting. 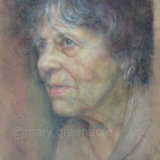 I enjoy exploring the subtle interplay of colour and light on a still life or the human face. To this end my compositions are carefully staged and lit in order to exploit this to the full. My inspiration comes from a number of artists depending on the work I am doing. I have always liked the subtlety of paintings by British artists such as Gwen John, Winifred Nicholson and Mary Potter, but more recently I have turned to early Italian Renaissance paintings for my inspiration. Whilst my art work is carefully planned, I rarely have a pre-conceived idea of the final outcome, and it tends to evolve until the balance of shapes and colours feels right. Overall, I aim to suggest a gentle presence. For me, the work is only successful if it resonates with the viewer in a meditative or contemplative way. I also run art workshops from my garden studio in Brittany. The workshops compliment my own art practice and play an integral part in my artistic development. The planning of these enables me to reflect on how I approach my own work, and I find I learn just as much from the participants as I hope they learn from me. Click here to find out more about my workshops.